1. HEAT oven to 350°F. BEAT eggs in large bowl until blended. ADD ricotta cheese, flour and baking powder; mix well. STIR IN Italian cheese, ham and green onions. POUR in greased 13 x 9-inch glass baking dish. 2. BAKE in 350°F oven until puffed, golden and knife inserted near center comes out clean, 40 to 50 minutes. LET STAND 5 minutes. 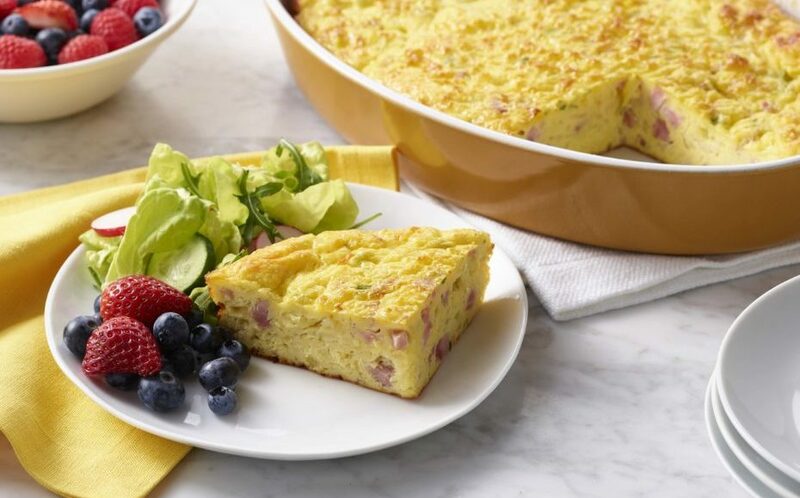 An easy and tasty brunch egg bake with a medley of minced onion, chopped ham and melted Italian cheese. This recipe is an excellent source of choline and protein.